Antibiotics are facing an existential crisis less than a century since their introduction. The bacteria-fighting drugs are becoming less effective as a result of their overuse in both humans and animals. At the same time, R&D on new antibiotics has slowed to a crawl, putting the world at risk of entering a dangerous era in which routine infections are untreatable. 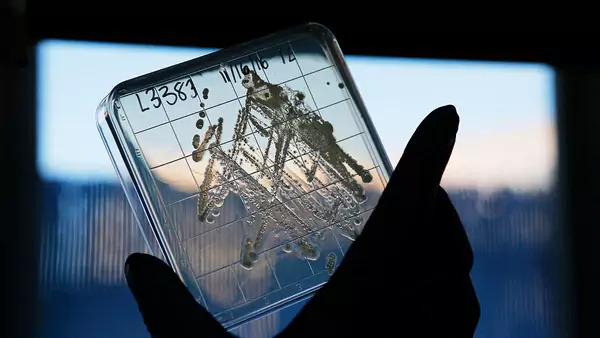 The global death toll from drug-resistant infections, estimated to be at least seven hundred thousand annually, could reach into the millions by 2050. Some governments and international organizations are investing billions of dollars to tackle the problem, but many analysts say its scope and immediacy require a globally coordinated response. Introduced in the late 1920s with the discovery of penicillin, antibiotics are a class of drugs used to treat bacterial infections. They fall into a larger drug class, antimicrobials, which includes medications to fight microorganisms such as viruses, fungi, and parasites. Antibiotics were mass produced during World War II, and their use soared in the second half of the twentieth century. More than one hundred antibiotics have been developed. A lot of what we do every day in the hospital depends on having antibiotics work effectively. Doctors and health-care professionals rely on antibiotics as a primary treatment for common bacterial infections, including strep throat, tuberculosis, urinary tract infections, and some sexually transmitted infections. The drugs are also critical for patients whose immune systems have been weakened by chemotherapy or major surgery. “A lot of what we do every day in the hospital depends on having antibiotics work effectively,” says Kathy Talkington, an expert on antibiotics at the Pew Charitable Trusts. Antibiotics have contributed to a substantial decline in global deaths from some types of infections. For instance, the death rate for syphilis, a major public health crisis in the early twentieth century, plummeted after the introduction of penicillin to near zero by 1975. More recently, antibiotics have prevented more than fifty million tuberculosis-related deaths [PDF] since 2000, according to the World Health Organization (WHO). How do bacteria develop resistance to antibiotics? Like all organisms, bacteria adapt and evolve to their environments through a process of natural selection. Bacteria that develop defenses against antibiotics are the most likely to survive, reproduce, and spread. Therefore, the more antibiotics are used, the more opportunities bacteria have to improve their defenses, and the less effective antibiotics become. Tens of billions of antibiotic doses are consumed around the globe annually, a large portion of which, health experts believe, is wasted on patients with viruses or other illnesses that do not respond to antibiotics. In the United States, the Centers for Disease Control and Prevention estimates that one-third of all antibiotic prescriptions are unnecessary. The problem is likely worse in the dozens of countries where antibiotics can be bought over the counter or on the internet. In 2015, the WHO found antimicrobials were available without a prescription [PDF] in more than half of the 133 countries that submitted data. Meanwhile, the demand for antibiotics shows little sign of abating. Global consumption jumped 65 percent [PDF] between 2000 and 2015, driven largely by low- and middle-income countries, particularly Brazil, China, and India. In some countries, antibiotics continue to be doled out for “everything from headaches and fatigue to childbirth and bona fide bacterial infections,” writes former CFR Senior Fellow Laurie Garrett. Does the agriculture industry contribute? Antibiotics are also given to animals, particularly those being raised for slaughter on industrial farms. Farms are estimated to account for roughly 70 percent of total antibiotic sales in the United States; the proportion is even higher in some other countries. Experts urge veterinarians to reserve antibiotics for sick animals, but breeders commonly use the drugs to prevent disease and boost animal growth. This overuse contributes to the spread of resistant bacteria, which can be transmitted from animals to humans through the food chain and in more indirect ways. The U.S. farming industry has often been reluctant to cooperate with scientists researching how antibiotic resistance is transmitted between species. However, consumer pressure has pushed some large companies, such as Perdue Farms, to curb their use of antibiotics. Doctors and health-care providers have raised alarm in recent years about the proliferation of bacterial strains, sometimes referred to as superbugs, that are resistant to multiple drugs, or even to all drugs. As a result, infections such as pneumonia and urinary tract infections are becoming far more difficult to treat. For example, the class of antibiotics most commonly used to treat urinary tract infections is now considered ineffective for more than half the patients in many parts of the world, according to the WHO, and forms of tuberculosis resistant to commonly used antibiotics are on the rise [PDF]. Patients with drug-resistant infections remain hospitalized for longer periods; they are also more likely to die. An estimated seven hundred thousand die each year from drug-resistant illnesses caused by bacteria and other microorganisms. In 2016, five people in a brand new hospital unit in eastern China died from a pneumonia superbug for which researchers said there was no effective drug available in the country. 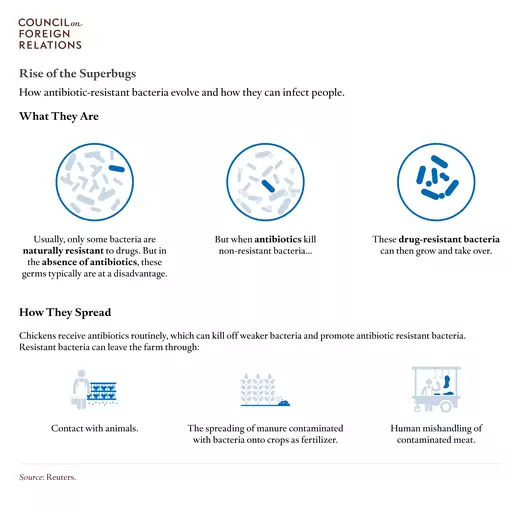 Some health analysts say that without containment efforts the world is on track for a post-antibiotic era in which superbugs could kill up to ten million a year by 2050. Resistance to antibiotics and other antimicrobials could also take a significant toll on the global economy. The World Bank projects [PDF] that antimicrobial resistance could cost $1 trillion to $3 trillion in lost output annually by 2030, with poor countries likely bearing the brunt of the impact. Are new antibiotics on the horizon? The pipeline for new medications is running dry; no new class of antibiotics has been discovered since 1987. Scientists have developed variations of existing drugs, but many say these are not sufficient to stay ahead of evolving bacteria and other microorganisms. This is in part because many pharmaceutical companies in recent decades have shied away from the market for antibiotics, which is not as profitable as the market for drugs to treat chronic health conditions, such as heart disease and diabetes. On top of this, inventing new drugs has become more difficult, leading many pharmaceuticals to abandon antibiotics R&D in the 1990s. “The kinds of resistance you are seeing now don’t seem to be amenable to yet another tweak to this particular class of molecule,” former pharmaceutical executive John Rex told PBS NewsHour. What are governments doing to address resistance? Health experts, international organizations, and many governments have called for greater coordinated action to regulate antibiotic use and increase investment in the development of new drugs. In the United States, the Obama administration launched an antibiotic resistance action plan in 2015, pledging more than $1 billion to develop new antibiotics, reduce inappropriate use of the drugs, and up surveillance of drug-resistant strains. The Trump administration has said it will continue implementing the plan, and Congress recently boosted funding for several health agencies in an omnibus spending bill. The Food and Drug Administration has prohibited the use of some antibiotics for promoting livestock growth, and in 2016 U.S. sales of antibiotics for food-producing animals dropped for the first time since tracking began in 2009. The United States has also partnered with the United Kingdom to launch one of the largest public-private initiatives to fight superbugs. By the end of 2017, the project had put tens of millions of dollars into prospective drugs, including eight new classes of antibiotics, half of which target gram-negatives. Strides have also been made in other forums. The European Commission has backed an initiative to streamline research happening across the continent, while Group of Twenty (G20) nations are working on their own research hub. Another EU-sponsored public-private partnership has dedicated 700 million euros to antibiotic development. However, some governments have been reluctant to impose regulations, fearing that doing so could harm food security and economic growth or push life-saving drugs further out of reach of millions of citizens. Many argue, however, that without populous countries, such as India and China, stepping up to restrict antibiotic use, efforts elsewhere will be undermined. Both countries have implemented national action plans on antimicrobial resistance, a step the United Nations urged all member states to take by 2017. Some analysts say a global response is required. “Antibiotic resistance presents a classic example of the ‘tragedy of the commons [PDF],’” write Aidan Hollis and Peter Maybarduk. In addition to reducing inappropriate use and increasing investment in new antibiotics, they advocate for an international accord that would increase access to antibiotics for low-income populations. In 2016, the UN General Assembly convened a summit on antimicrobial resistance, marking the broadest collaboration yet to fight the growing threat.